Bali Rafting + Snorkeling + Kecak Dance tour is one of our most exciting package for you to go snorkeling at Tanjung Benoa beach then go on rafting on the Ayung river for fun adventure and finally watch Kecak and fire dance with Ramayana story. Bali Rafting Adventure always understand your Bali adventure needs, get our special rate and get the most memorable trip in Bali. 09.00 – Arrive at Tanjung Benoa Beach for Snorkeling & turtle island tour. 12.30 – Having Light Lunch. 14.00 – Start Rafting Adventure with 2 hours journey. 16.00 – Finish Rafting, Going up to restaurant for shower and changes. 18.30 – Enjoy Kecak & Fire Dance. 19.30 – Transfer back to Hotel. The famous South of Bali beach where we take a Glass Bottom Boat trip to visit the island for conserving turtles. You will also have the opportunity to feed fish from your boat. Finally, but not least, you will have the best snorkeling place to enjoy the underwater lifes. Light Lunch and soft drink will be served after the activities. Come and join the Ayung River professional team to enjoy fantastic and unforgettable whitewater rafting adventure in Bali through a winding gorge, the magnificent jungle and the beautiful terraced rice field. The water volume is stable all year round with few water speed, which allows you to enjoy yourself with lots of fun. From the start, you will be fitted with life jackets and helmets. Our trained professional guide with international standard equipment will help you manage your safety through approximately 12 km in an exciting grade II and III rafting site for about 2 hours. Follow his instructions and paddle along the way, laughing, shouting and having an unbelievable adventure. 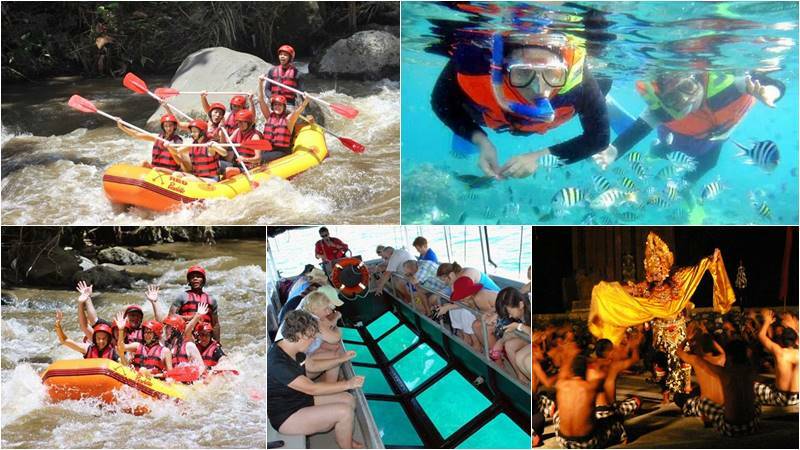 Ayung whitewater rafting is the best way to experience the beautiful of the Ayung River. Lunch at finish point restaurant. Kecak Dance is performed by about 50 men shouting the CHAK words and the theme story they played taken from the Ramayana story. What tells of Sri Rama’s journey is an incarnation of God to his brother Laksamana to release his wife, Sita, who was kidnapped by Alengkapura’s king Rahwana. At the end of the show, it will be combined with trance fire dance. Ticket for the Ayung river rafting. Ticket for the Turtle island with glass bottom boat and snorkeling. Ticket for the Kecak & Fire Dance.